“Preventive medicine” is a hot phrase in discussions of health reform. If we just get more people (why not everyone!) screened we can find disease early and save money by attacking these diseases before they become serious and expensive. But this use of ‘prevention’ is expensive. Or said another way: There’s a lot of money to be made in this kind of ‘prevention’. True preventive medicine prevents disease: Reducing airborne particulate matter and pollution prevents incidence of asthma. Funding schools to provide healthy meals prevents childhood obesity. Eliminating the use of lead in paint prevents abnormal development in exposed children. We must recognize that health screening technologies are not tools to prevent disease; rather, they are tools of early detection of disease. In a sense they define disease. Indeed as screening tools increase in specificity, the thresholds in defining disease status follow in their specificity. Certainly, early detection may give the upper hand to the patient and provider who can implement treatments that reduce the likelihood of that condition becoming life-threatening. But do all abnormalities warrant medical intervention? Screening technologies such as MRIs are become increasingly sensitive to discovery. In his book How Doctors Think, Jerome Groopman, M.D., cites a physician: “The hateful part of MRIs – I mean they can be a wonderful technology – but they find abnormalities in everybody.” No doubt, part of the rise in the number of chronic conditions can be attributed to our increased ability to find abnormalities, even though not all abnormalities may warrant a medicinal response. Screening tools do not and cannot prevent abnormalities. They can only find abnormalities. The primary driver of health care costs is medical technology. Earlier detection coupled with expensive (yet often unproven) interventions have reduced mortality while increasing morbidity. Indeed, many diseases which even 15 years ago would have been a death sentence have now become manageable chronic conditions (HIV/AIDS is an obvious example). This is a testament to our ability to innovate and develop life saving technologies. Simultaneously, technology has improved our ability to detect ‘disease’ while ensuring chronic care management through pharmaceuticals and/or invasive intervention through biopsies and more. Today, more than half of all Medicare beneficiaries have more than 5 chronic conditions. Soon it will not be uncommon for the bulk of Medicare beneficiaries to have eight or even ten chronic conditions. The unfortunate reality is that it is possible to over ‘prevent’ (to use the expensive version of the word). What is needed is not a halt on innovation nor a moratorium on technology. Rather what is needed is a conscious assessment as to when to screen and when treatment is necessary. The decision as to when to do what should be made between physician and patient, but information is needed to build suggestive guidelines. Health IT, allowing for the aggregation of (anonymous) data, can help. The global market penetration of cell phones is noteworthy, but the incredible rate of growth even more so. 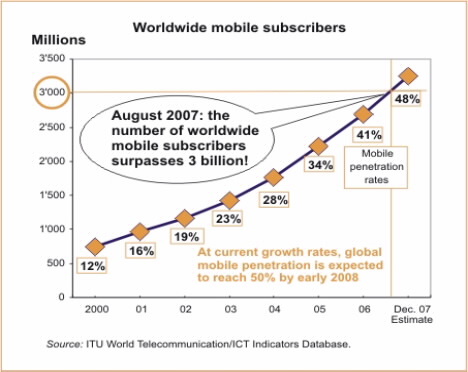 In 2000, there were about 800 million mobile subscribers (12% of the world’s population). By the end of 2008, there are expected to be over 4 billion subscribers! See a September 2008 article from the International Telecommunications Union: Worldwide mobile cellular subscribers to reach 4 billion mark late 2008 for more details. China already has the most mobile subscribers in the world (see my previous post on Mobile Phones) and by the end of 2008 the BRIC countries (Brazil, Russia, India and China) will have approximately 1.3 billion subscribers, or one-third of all mobile phone users. Last year, Pakistan added more new mobile connections than the USA! The US has actually fallen behind many countries in Asia-Pacific region with only 80% subscriber penetration. President Bush made widespread broadband and mobile access a priority in 2004 (although did very little to make this happen). President-Elect Obama has also stated that access is a priority of his administration. Ellen Romer of Experian Consumer Research published a report entitled U.S. 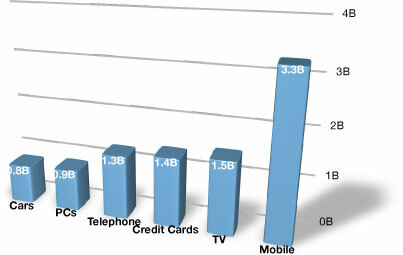 Closing Mobile Usage Gap in April 2008 with statistics on US mobile usage. Mobile connectivity is no longer exceptional, even in rural, underdeveloped regions. Mobile phones, broadly categorized as information and communications technologies (ICTs) along with internet and landlines, enable stronger and larger social networks, increase knowledge dissemination and creation, freedom of expression, political, societal, and economic participation, and adoption or creation of new technologies. 3rd-generation networks will become the norm, making internet access possible anywhere in the world without a computer. The increase in individual access to information that the internet provides is perhaps one of the most empowering and capabilities-enhancing functions of modern technology and has the potential to transform the developing world. In a nutshell, a singularity is a mathematical term for a region at which a quantity becomes (nearly) infinite. Analogously, a singularity is a point in time at which a critical mass is reached making radical transformation inevitable. Globalization and the integration of the world economy, rapid evolution of technology and widespread adoption of communications technology (mobiles and internet), and growing political will and social activism all point towards a time of dramatic transformation. An internet-connected individual now has convenient, free access to volumes of information. The number of internet users has quadrupled from 360 mil to 1.5 billion since 2000, and most growth is in the developing world (see http://www.internetworldstats.com/stats.htm for more charts). Ray Kurzweil is the king of the technological singularity, an idea largely based on the observation that Moore’s Law has held true for 25 iterations. Moore’s Law states that computer processing power doubles every 18 months. About 456 months have passed since Intel introduced the first widely used microprocessor (the Intel 4004), which means the microprocessor has experienced 25 doublings! According to many scientists, there is no other phenomenon in the universe that has experienced 25 iterations of exponential growth–and no end is in site. For theories of how this rapid change might effect us, how to copy our brains onto computers, and stories of telekinetic monkeys, check out Joel Garreau’s book, Radical Evolution. Given how pervasive technology is, this transformation must also affect health. In the short-term, this means advances in health data mining, Health 2.0, dramatic improvements in medical imaging, and customized treatment based on patients’ DNA. Medium-term: accurately simulating protien folding and drug interactions using computers, and an AIDS vaccine. Long-term: nano-robots fight cancer and other infections on a cellular or molecular level and altering the DNA of fetuses. Widespread use of the PC began only 25 years ago. The World Wide Web Consortium (W3C) formed in 1994. In many ways, computers and the internet are immature technologies that are still evolving. The interface between machines and humans is only beginning to be explored. It is probable that these evolutionary forces, combined with globalization, collaboration at the intersection of knowledge domains, and technology-facilitated revolutions in nearly every sector of industry, will have even greater long-term effects on the average person and society as a whole. Singularity is a blog dedicated to technological transformations and social change. I’ll save the full meaning of a singularity for a later date; instead, I’ll mention a singular company pursuing social change in new ways. In honor of it’s 10th birthday, Google introduced Project 10^100, a competition “call[ing] for ideas to change the world by helping as many people as possible”. Winners receive a portion of the $10 million prize pot. The catch? It’s got to be realizable within 1 to 2 years. Submission deadline is October 20. In case you’re short on ideas, check out Y-Combinator’s top 30 ideas they would like to fund: Startup Ideas We’d Like to Fund.